Creating a home that a families could live in for more than 300 years and the equipment would be environmentally friendly. For the HVAC system, passive house methodology was used to create an ERV - Energy Recovery and Ventilation System. 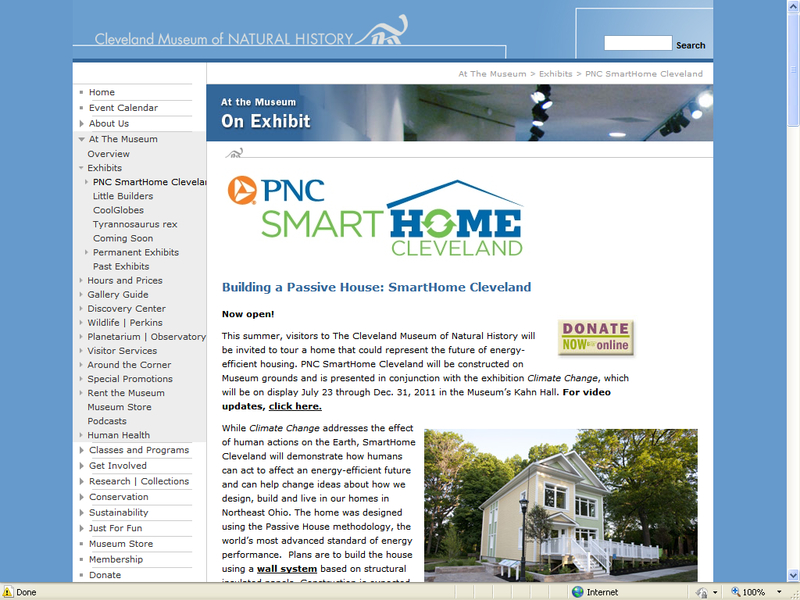 PNC SmartHome Cleveland was constructed on the grounds of the Cleveland Museum of Natural History and was presented in conjunction with the exhibition Climate Change to represent the future of energy-efficient housing. The home was designed using Passive House Methodology, the world's most advanced standard of energy performance. Designed to function without a furnace, the SmartHome is 90% more efficient than a typical home. It was constructed using sustainable materials and furnishings, advanced storm water techniques, healthy housing initiatives and bio-phillic design to connect occupants to nature. Our role as a partner in this project was to design an efficient heating / cooling and energy recovery ventilation system "ERV" for the home. The 2-story house has a net living space of 2,500 square feet including 3 bedrooms and 2 1/2 baths plus a full basement. The extra thick insulated panels were applied to the outside of the interior walls and wrapped in a barrier paper to form a seal so tight that the home "ERV" system will sense when fresh air is needed. The SmartHome works the same was as a thermos, transferring energy at 84% efficiency. Since the heating demand is so low that no conventional furnace is needed and the home can survive the cold winters by utilizing a ductless, air-source heat pump that also provides supplemental cooling in the summer.